Metropolitan Kallistos (Ware) (born 1934) – is an English-born bishop and theologian of the Eastern Orthodox Church. From 1966 to 2001, Ware was Lecturer of Eastern Orthodox Studies at the University of Oxford. He has authored numerous books and articles pertaining to the Orthodox Christian faith. “If the strongest argument in favor of universal salvation is the appeal to divine love, and if the strongest argument on the opposite side is the appeal to human freedom, then we are brought back to the dilemma with which we started: how are we to bring into concord the two principles God is love and Human beings are free? For the time being we cannot do more than hold fast with equal firmness to both principles at once, while admitting that the manner of their ultimate harmonization remains a mystery beyond our present comprehension. What St Paul said about the reconciliation of Christianity and Judaism is applicable also to the final reconciliation of the total creation: “O the depth of the riches and wisdom and knowledge of God! How unsearchable are His judgments and how inscrutable His ways!” (Rom 11:33). When I am waiting at Oxford Station for the train to London, sometimes I walk up to the northernmost stretch of the long platform until I reach a notice: “Passengers must not proceed beyond this point. Penalty: £50.” In discussion of the future hope, we need a similar notice: “Theologians must not proceed beyond this point”—Let my readers devise a suitable penalty. Doubtless, Origen’s mistake was that he tried to say too much. It is a fault that I admire rather than execrate, but it was a mistake nonetheless. Our belief in human freedom means that we have no right to categorically affirm, “All must be saved.” But our faith in God’s love makes us dare to hope that all will be saved. Knocking on the moonlit door. 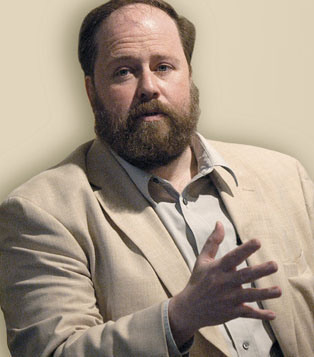 David Bentley Hart (born 1965) is an American Orthodox Christian philosophical theologian, cultural commentator and polemicist. “Origen hoped for the ‘restoration of all’, apokatastasis panton… His conviction did not simply rest on a philosophical belief that ‘the end is like the beginning’ a principle he affirmed several times in On First Principles… There is a deeper reason for Origen’s conviction of final restoration for all: for him it is inconceivable that Christ is to remain in sorrow for all eternity on account of the failure of any rational creature to respond to his love and benefit from his sacrifice. Dr. Andreas Andreopoulos (1966- ) – Orthodox priest, studied in Greece, Canada and the UK, obtaining his Ph.D. in Theology and Art at Durham University.